How much living space does the average household have in Japan? There is a stereotype that homes in Japan are so small that they can be likened to rabbit hutches. 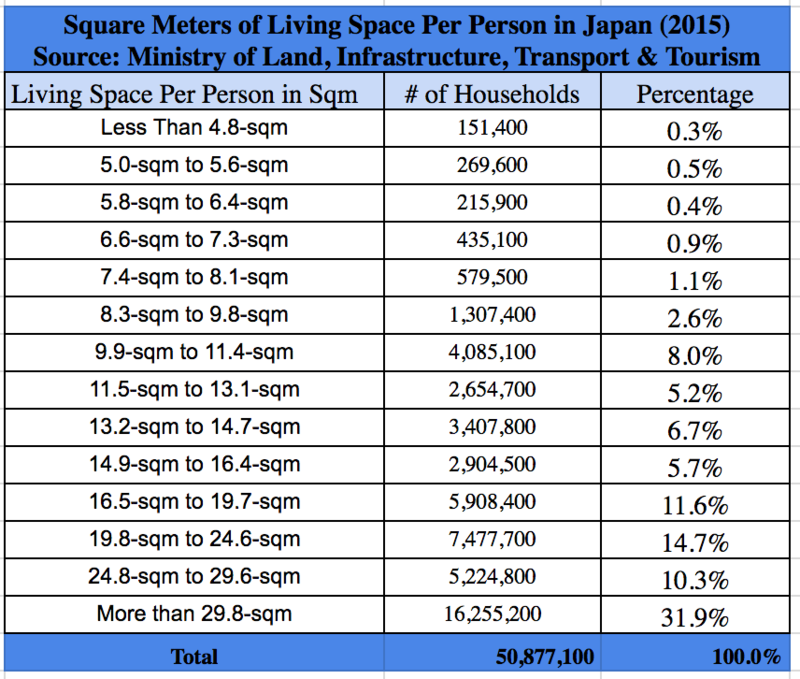 In this article we take a look at the data to see the average amount of living space per person in Japan in terms of square meters. How much living space should a person have? 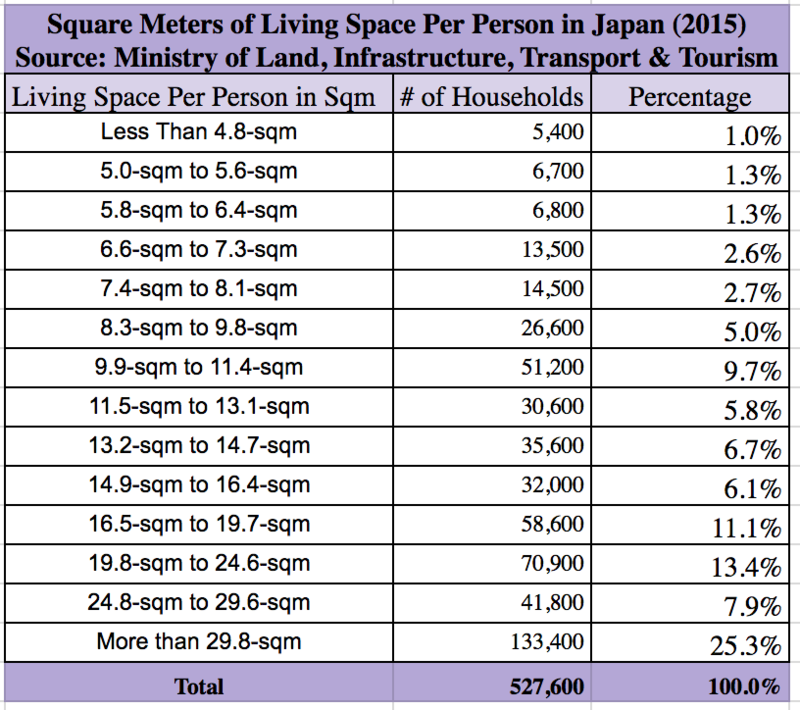 Japan’s Ministry of Land, Infrastructure, Transport and Tourism (MLIT) publishes detailed guidelines (in Japanese) on the minimum and recommended (ideal) amount of living space that a person should have to have a “healthy and culturally fulfilling life”. According to these guidelines, a single person living by himself in a city center or suburb should have at a minimum 25-square meters (269-sqft) of residential space. The ideal amount of space for a single person living a city is much higher: 40-square meters. If you live in the countryside, the MLIT raises its guidance to a spacious 55-square meters, more than double the minimum recommendation for a city-dweller. The following tables detail the calculation for recommended living space, in square meters, for single and multiple-person households. According this method of calculation, a two-person household living in the city should have a minimum of 30-square meters of living and ideally, 55-square meters. A two-person household in the countryside would ideally have 75-square meters to themselves. Please see the chart below for recommendations for bigger households and households with children. The MLIT also conducts a survey every five years on the actual average amount of living space a person has in Japan, broken down by prefecture and major city. The data below is for 2013, when the last survey was conducted. The data is reported by the number of tatami mats of dwelling space per person. A tatami mat is a flooring material used in traditional-style rooms and is also a standard unit of measurement in the Japanese real estate industry. One tatami mat is equal to about 1.7 square meters or 18.3 square feet. The floor size of rooms in apartments and houses is often measured in the number of tatami mats. The survey divided the amount of living space into fourteen segments, ranging from “less than 2.9 mats” to “18-mats or more” per person. 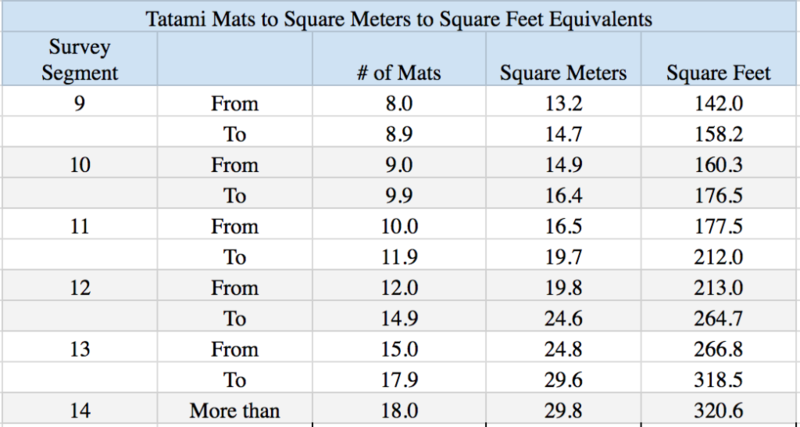 The following tables show the equivalent amount in square meters and square feet. As we mentioned above, the Ministry recommends that one person should have at a minimum 25-square meters of living space, so households falling between segment one (less than 4.8-sqm) to segment twelve (24.6-sqm) have less than the minimum per-person recommended amount of living space. 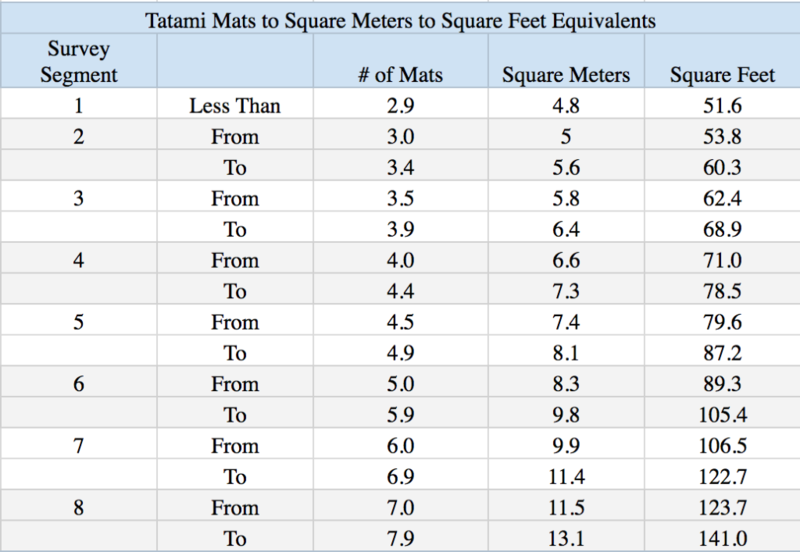 We have converted the data originally calculated in tatami mats into square meters in the tables below. 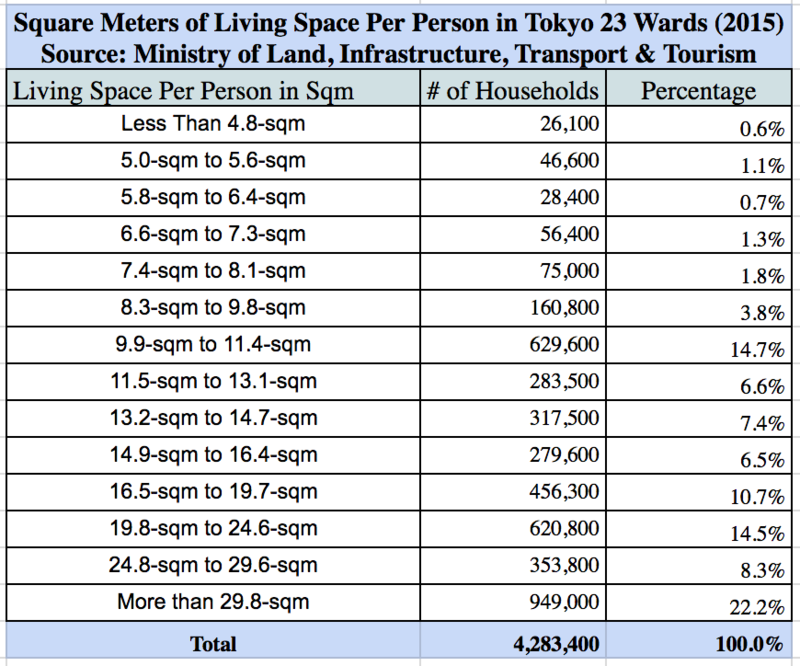 Now back to the question: What is the average living space per person in Japan? For the country as a whole, on average, each person in Japan had 13.5-tatami mats of living space or 22.3-square meters. Looking at the segment breakdown, the data shows that about 42% of households had enough living space per person to meet the government’s minimum recommendation. In Tokyo’s 23 Wards, as can be expected, the average living space per person is lower than the national average. In the 23 Wards, the average household had enough living space to allot about 19.1-square meters per person. The situation in Osaka was similar to that in the Tokyo 23 Wards. 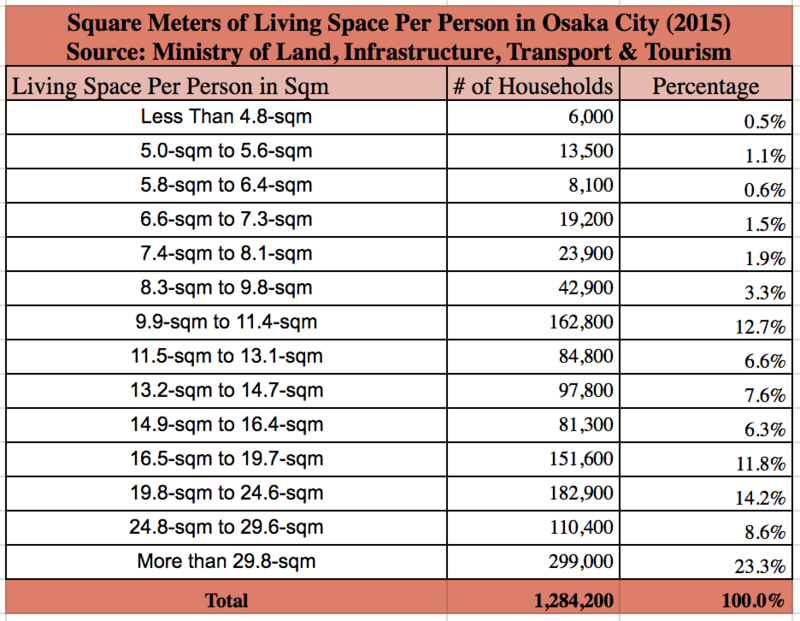 In Osaka, the average household had enough living space to average to about 19.2-square meters per person. Despite living in one of Japan’s top three metropolitan areas, Nagoya’s residents enjoyed a little more space per person than people living in Tokyo and Osaka. 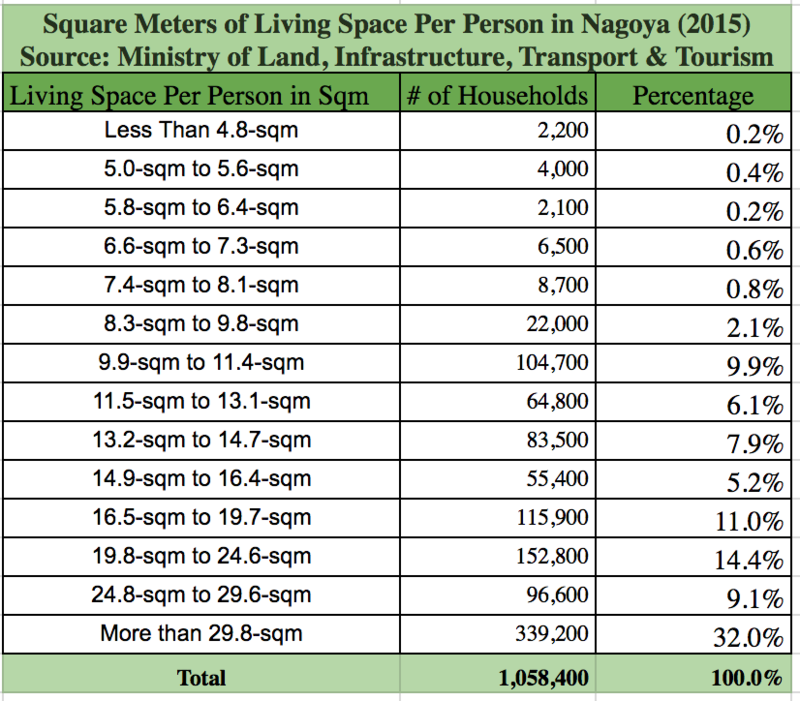 In Nagoya, the average household had enough living space to average about 22.2-square meters per person. What prefecture had the highest average amount of living space per person? Akita prefecture, in northern Honshu, wins the crown for having the highest average living space per person. In Akita, the average household had enough living space to average to about 28.6-square meters per person. This is well above the government’s minimum recommendation of 25-square meters. However, most of Akita is rural, and if we were to use the ideal (55-square meters) versus the minimum recommendations, the average of 28.6-square meters falls short. 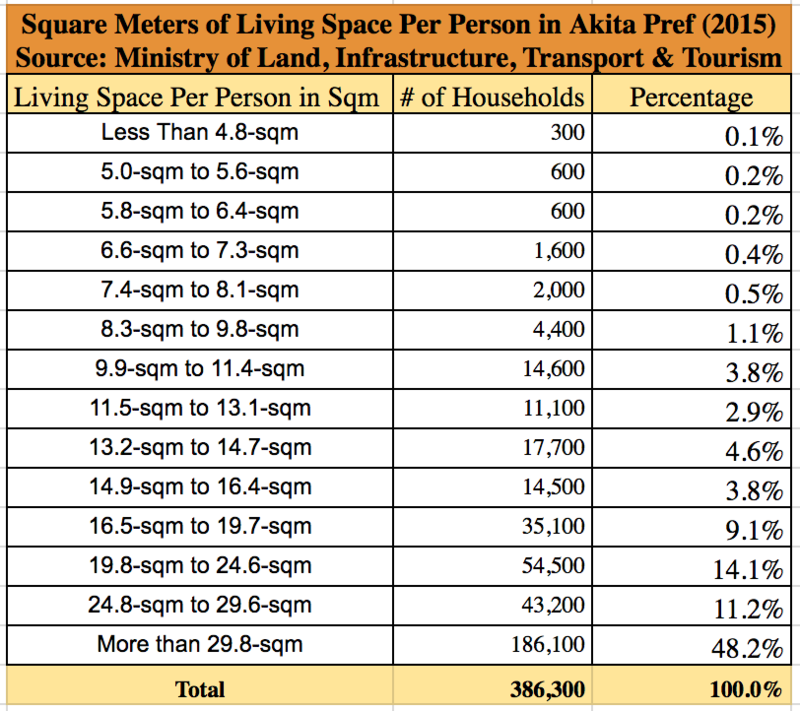 Still, a hefty 48% of residents in Akita have at least 29.8-square meters of living space. Please see the breakdown below. Which prefecture had the lowest average amount of living space per person? According to the survey, tropical Okinawa prefecture, had the lowest average living space per person. In Okinawa, the average household had enough living space to average to about 17.7-square meters per person.